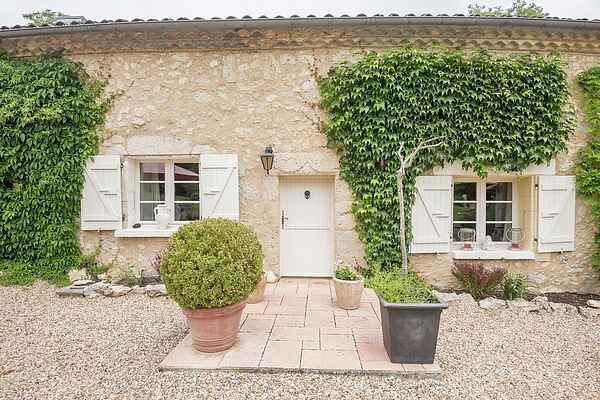 This charming farmhouse from 1700 is attractive and luxuriously furnished. The location is a few kilometers away from Condom, a town with markets, a terrace, and a river, where you can rent boats. The pilgrimage route de Compostela passes through the village and everywhere you can taste the delicious wines. A top environment for thoses who enjoy walking, cycling and water sports. Even golfers can practice their skills on one of the most spectacular courses in the area. The grounds of the farmhouse are beautifully undulating with big lawns where children can play. For additional entertainment, there is a trampoline, a ping pong table and on the thick branch of a tree hangs a swing... The swimming pool is fenced and on the terrace are sunbeds and parasols. At the farmhouse is an elongated, partially covered patio, where you can enjoy good food. Inside is a pleasant living room with beautiful wooden beams and high ceilings. The bedrooms are equipped with excellent beds and the bathrooms are clean and fresh. The caretakers live on site in their own home, entirely private, without intruding on your privacy. Highly recommended.